This year’s conference on computer graphics convened by the ACM SIGGRAPH organization will take place in Anaheim, California and we’re proud to be a part of it! As one of the few software development companies we were accepted to attend the Appy Hour where independent app developers introduce their apps to SIGGRAPH 2016 attendees. 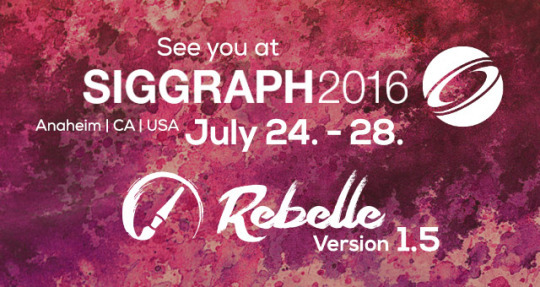 SIGGRAPH is widely considered the most prestigious forum for the publication of computer graphics research and we can’t wait for the conference and exhibitions to begin! At Appy Hour we’ll be presenting brand new Rebelle 1.5 version with improvements like custom color sets, canvas rotation, touch support for tablets and Wacom displays, support for interface translations, easier canvas tilting, native pen pressure support for Surface tablets and many more. We’re looking forward to receiving the feedback from the most competent experts and artists in this field and releasing Rebelle 1.5 to public afterwards. We’re so thrilled! The conference starts on July 24th and the Appy Hour will take place on July 27th. Those of you who will be there, definitely drop by and speak with Peter Blaškovič and Michal Fapšo or schedule the meeting with Escape Motions via email info@escapemotions.com.